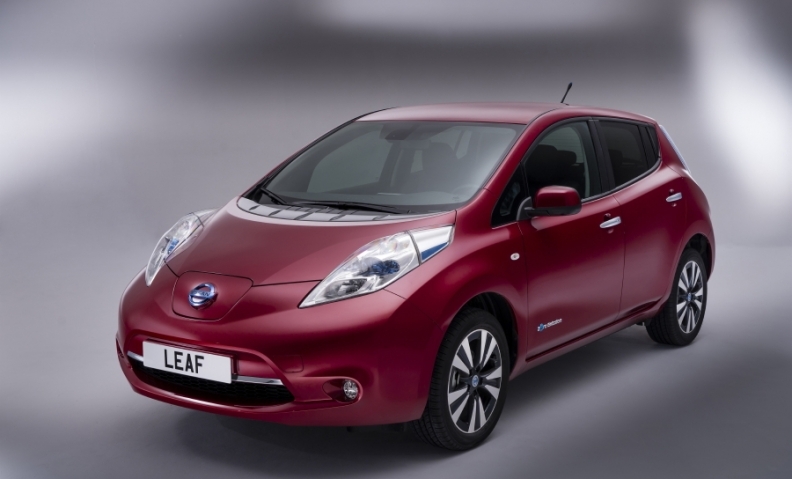 The new entry-level Leaf is expected to start at 23,990 euros. Nissan has extended the range and lowered the price of the Leaf electric car that the automaker will begin making in the UK in April. The new European version of the Leaf, which will debut at the Geneva auto show next week, will have a range of 200km (129 miles), up from the 175km range offered in the version of the car made in Japan, the company said today. No official prices for the updated Leaf for Europe have been revealed, but a Nissan source told Automotive News Europe that the new mid-level Leaf will start at the same price as the current car, which is 25,990 euros in France after government subsidies. The new entry-level Leaf is expected to cost 2,000 euros less than the mid-level Left, the source said, resulting in a price of about 23,990 euros in France. This is the second price cut in less than a year for the European Leaf as Nissan tries to spark interest in the car. In January, Nissan announced a price cut of 3,000 euros. This came after Nissan missed its target of selling 9,000 Leafs in Europe last year. The car's volume was just 5,210 units, according to figures from JATO Dynamics. The European Leaf will be built Nissan's plant in Sunderland, England, where the automaker also will produce the car's lithium-ion batteries. Along with the range improvement, Nissan says the Leaf driving dynamics have also been upgraded because of changes to shock absorber settings and steering weight. In a statement the automaker said the performance tweaks would make the Leaf "more in tune with European tastes". Visual changes are limited to a more aerodynamic grille, while buyers will have an increased number of wheel options to choose from. Space has been boosted in the trunk by moving the charger assembly to under the hood. Trunk capacity increases to 370 liters from 330 liters, bringing it more in line with that of rivals in the compact sector. Customers can also choose a faster 6.6 Kw charger, which replaces the standard 3.3 Kw system. Nissan says this will enable the use of 32-amp charging available from the latest generation of home and commercial systems. Nissan said to improve the car it analyzed data from telematics on current cars, as well as speaking to owners. "Leaf owner experiences have … influenced many of the changes we have made," Paul Willcox, head of sales and marketing for Nissan Europe, said in the statement. In response to the feedback, the Nissan has added and LED light to the new Leaf to make it easier to plug in the car when it is dark. The plug also now locks automatically. Nissan said it had also addressed owners' fears of an accelerated reduction in battery capacity with a new so-called State of Health clause in the warranty that we require the automaker to repair or replace a battery that is not holding enough of a charge. The clause would be triggered if the battery gauge failed to show fewer than nine of the total 12 bars when fully charged at any time during the car's first five years or 60,000 miles (100,000km), a spokeswoman said. "Owners have expressed concerns that it could happen," she said, adding that Nissan had received no reports of such a situation. The company said this warranty clause would be retroactively applied to existing Leafs. Nissan said total production of the Leaf passed 50,000 cars earlier this month.